Telescope Beach, part of Grenville Bay in the northeast of the island, is one of several coastal communities – including Grenville, Marquis, Soubise and Telescope – that were severely damaged by the massive force of Hurricane Ivan in September 2004. 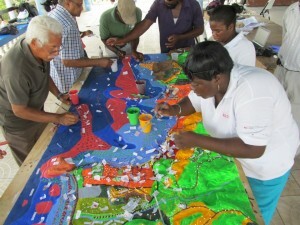 Funded by the The Nature Conservancy (TNC), the At Water’s Edge (AWE) project aimed at demonstrating that governments and communities of small island developing states (SIDS) can enhance their resilience to climate change by protecting, restoring and effectively managing their marine and coastal ecosystems and strengthening local capacity for adaptation. Partner in implementing the AWE project in Grenada has been the Grenada Fund for Conservation (GFC) and the Grenada Red Cross Society. Their activities have focused on reducing the risk and vulnerability of the Grenville Bay Area by establishing a living shoreline and building the community’s adaptive capacity. In 2013, the initiative benefitted from additional support provided by the Technical Centre for Agricultural and Rural Cooperation ACP-EU (CTA) and Sustainable Grenadines Inc. 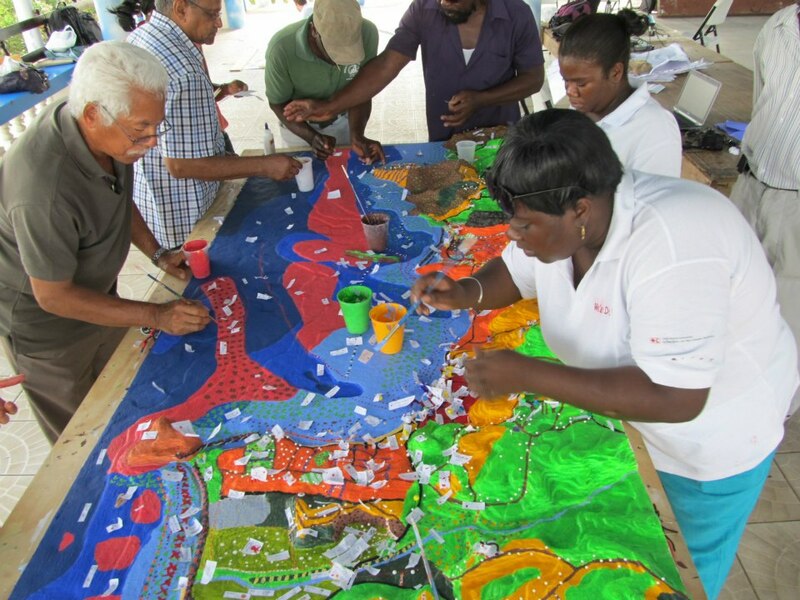 This allowed GFC to mobilise local stakeholders and facilitate the manufacture of a 1:5,000-scale participatory 3D model of the bay. The purpose of the participatory mapping activity was to identify risks related to climate change and extreme climate events and to produce recommendations on how to deal with the threats. The process allowed to collate the knowledge and identify perspectives of nearly 400 community members and to generate site level vulnerability assessments and visualization media. To help facilitate community input and visioning, TNC partnered also with a land-use planning firm. The latter generated a number of climate change impact scenarios and associated mitigating measures. 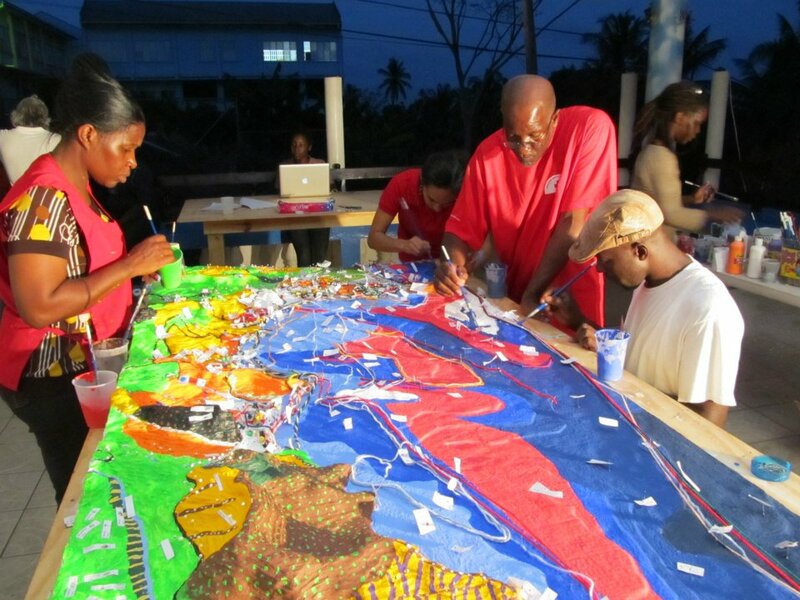 An impact assessment carried out by CTA in 2015 found out that the significant involvement of the community in the P3DM process contributed to influencing donor agencies to provide financial support to reef and mangrove restoration in the Telescope area. As of the end of year 2015, GFC was able to mobilise as a follow-up to the P3DM exercise an amount of USD 200,000. According to Tyrone Buckmire, GFC Executive director, additional USD 300,000 are needed to complete restoration of the entire area.